The horrific shootings at Sandy Hook Elementary in Connecticut in December, in which 20 school children aged 6 and 7 died, led to an outcry for effective measures to stop this from happening again. The gun control measure most commonly called for was reinstatement of the ban on assault weapons (the type of weapon used in the Sandy Hook shooting) that Congress had passed in September 1994. The law had a 10 year sunset provision, and with the more conservative political climate in 2004 during the Bush Administration, efforts to renew the law were blocked. Hence it expired in September 2004. The mother of the Sandy Hook shooter was then legally eligible to purchase an assault weapon, and her son used the one she had at their home to kill the 20 school children, after he first shot his mother. 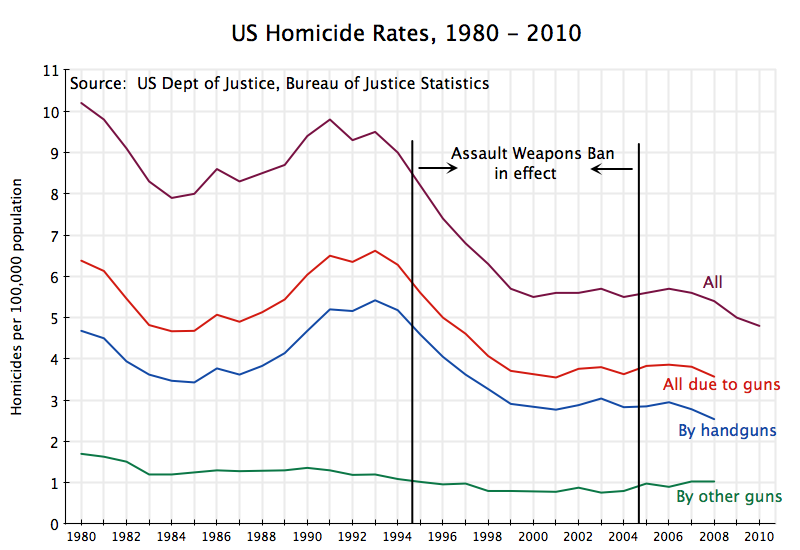 But did the 1994 Assault Weapons Ban law have an effect on homicides in the US, and separately on mass shootings? This note will review what we might be able to say from simple trends over time. The chart above shows US homicide rates between 1980 and 2010, with a breakdown (for 1980 to 2008) of the number of homicides as a result of the use of any gun, by handguns only, and by all other guns. Other homicides could be through the use of knives or other objects. The source is a report dated November 2011 on homicide trends in the US over 1980 to 2008, prepared in the Bureau of Justice Statistics of the US Department of Justice, and is the most recent such report available from this source. The chart shows that homicides did indeed decline sharply over the 1994 to 2004 period that the law was in effect (more precisely, September 13, 1994, to September 12, 2004). The overall homicide rate in the US was 9.5 deaths per 100,000 population in 1993, and this fell to a rate of 5.6 in 2005. The homicide rate from use of guns fell from 6.6 in 1993 to 3.8 in 2005. While these homicide rates are an improvement over what they had been, keep in mind that compared to other developed countries, the rates are still abysmal. Based on UN assembled data for 2010 (or the most recent year available), the total homicide rates were just 1.2, 0.8, 1.1, and 0.4 for the UK, Germany, France, and Japan respectively, and the homicide rates by firearms were only 0.1, 0.2, 0.1, and 0.0 for the four countries (where the rate in Japan rounded to 0.0 per 100,000 population as there were only 11 homicides in Japan in 2008, the most recent year with data available in the UN report on this; in 2008, the US had 11,030 homicide deaths by firearms. Japan has strict gun controls.). But can one attribute this fall in the homicide rate to be a consequence of the Assault Gun Ban then in effect? From just the relationship found in the chart, not really. There was much else going on during this period which could and probably did also have an impact on homicide rates. In addition, one can see in the chart that the decline in homicide rates began before the new law went into effect, and that the large fall then bottomed out around 2000, after which there was a small rise. Furthermore, one does not see a jump back to previous rates once the ban was allowed to expire in September 2004. Looking at this relationship over time, a stronger case could probably be made that the drop in the homicide rate was more due to the totality of measures implemented during the period of the Clinton presidency, from January 1993 to January 2001. This fits well the observed period when the homicide rate dropped. But here again, there was much else also going on which could affect the homicide rates, including at the level of state and local governments. It is also arguable that the metric used above (the overall homicide rate) is not the metric that should be used when assessing whether the Assault Gun Ban helped. The Assault Gun Ban only affected one category of gun (semi-automatic weapons), and highly imperfectly at that (which will be discussed below). Most murders are done with simple handguns. Particularly with the Sandy Hook shooting of school children very much in mind, can one say whether the 1994 Assault Gun Ban may have reduced the number of, and severity of, mass shootings? Following the Sandy Hook shooting, Mother Jones magazine recently updated a data set it had earlier prepared (after the Aurora theater shootings) on mass shootings in the US since 1982. 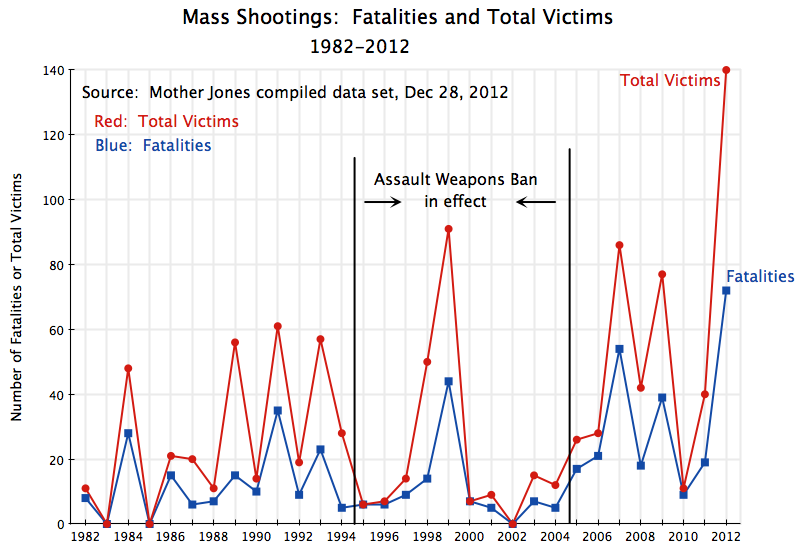 Using specific criteria to define what to include as a mass shooting (four or more people shot in a single incident; one shooter; the shootings occurred in a public place; and some other factors and with some specified exceptions), Mother Jones provides a well documented data set concluding that there were 62 mass shootings meeting its criteria over this period. They provide brief descriptions of each event, what weapons were used, the number of fatalities and the number of those wounded, and other relevant data. The number of mass shootings meeting the specified definition averaged 1.5 each year between 1982 and 1994, and possibly might have been rising in the period leading up to 1994 (I say possibly as the number of events are small, and it is not clear this is statistically significant). The annual average was about the same, at 1.6 per year, between 1995 and 2004, but with this average brought up by a high number in 1999 (the year of the Columbine High School shooting, but where there were five mass shootings in total), and to a lesser extent in 1998 (with three mass shootings). The numbers were low in the other years. After the Assault Gun Ban expired, the frequency went up, reaching 3.4 per year on average between 2005 and 2012, with an especially high number (seven) in 2012. Using the numbers underlying this figure, over 1982 to 1994 the number of fatalities in mass shootings averaged 8.5 per year and the number of total victims (including those injured) averaged 18.2. Over the period 1995 to 2004, the number of fatalities fell somewhat to 6.4 per year while the total number of victims fell to 13.2. The averages were higher than otherwise in this period due to the spikes in 1999 (the year of Columbine) and to a lesser extent 1998. The numbers then went higher in the period 2005 to 2012, after the Assault Weapons Ban expired, to 9.2 fatalities per year and 16.7 total victims per year. 2012 was a particularly bad year. But with the limited number of years and small number of incidents involved each year, it is difficult to say whether there were significant changes over time, and in particular whether the fatalities fell significantly during the period the Assault Weapons Ban was in effect. Were it not for 1999, and to a lesser extent 1998, the number of annual fatalities and victims would have fallen sharply during the period of the Assault Weapons Ban, and then risen again after it was abandoned. But 1999 and 1998 did occur, so it is hard to say whether the impact was significant. The underlying numbers also indicate that over the period as a whole, 73% of the weapons used in the mass shootings (and there were typically multiple weapons used in each mass shooting) were either semi-automatic handguns or long-barreled assault weapons. Both were in principle banned under the Assault Weapons Ban, but only the manufacture and sale of new such weapons were banned – the existing stock remained. Such weapons accounted for 67% of the weapons used in the mass shootings between 1982 and 1994, for 74% of the weapons during the period of Assault Weapons Ban was in effect, and for essentially the same share of 75% in the period 2005 to 2012 when the law had expired. There was no significant change during the period of the Assault Weapons Ban. 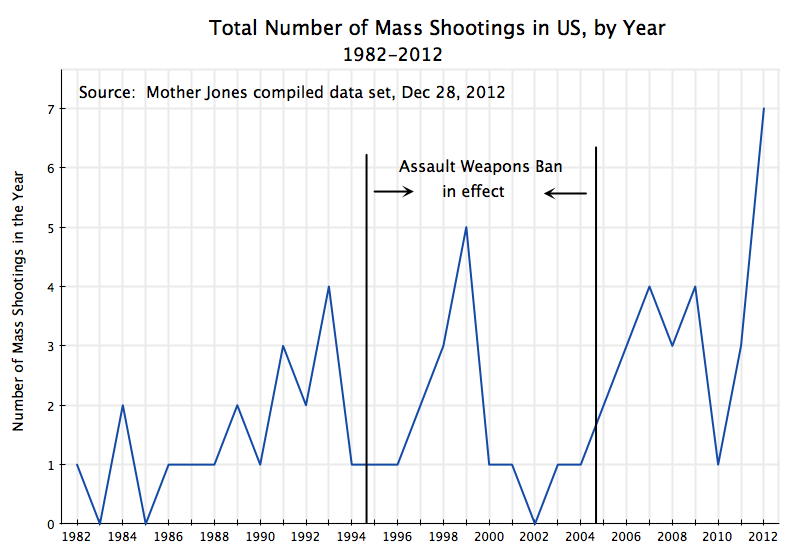 The evidence is therefore not clear whether the 1994 Assault Weapons Ban had a significant effect. But part of this is certainly a consequence of the “ban” being extraordinarily weak. While the law was controversial, and some attribute the loss of the Congress by the Democrats to a resurgent Republican Party that year (when Newt Gingrich became Speaker) to passage of the act, the act itself did little to “ban” assault weapons, despite the title. First of all, the law only affected the manufacture and subsequent sale of newly produced assault weapons. The existing stock of such weapons would remain, and could be sold or transferred between owners. In anticipation of the law, manufacturers flooded the market with a huge supply of newly produced weapons. Second, the law defined “assault weapons” in a highly specific way. As an advocacy group later noted, gun manufacturers soon found they could circumvent the law with what were little more than cosmetic changes to the existing arms. Finally, while the Assault Weapons Ban also limited the manufacture and sale of newly produced high capacity ammunition magazines (limited to ten rounds or less), the manufacturers also ramped up production of these clips and flooded the market in the period before the law went into effect. The high capacity clips were still widely available in 2004. With these limitations in the law, it is not surprising that it is difficult to determine with any confidence whether the law had an effect on homicides and mass shootings. And it appears as I write this, that President Obama is likely to propose tomorrow, January 16, a new assault weapons ban as a center piece of his initiative to reduce gun violence. I would certainly welcome this. But for the law to be effective, it will be very important that it take into account and remedy the limitations that made the 1994 Assault Weapons Ban so weak. And I do not expect that the current Congress will do this. It is also clear that the limitations that have been placed on serious research on the causes of gun violence has to end. These were discussed in a previous posting on this blog. As discussed there (and also see a recent summary here), the limitations on research have been imposed by a conservative Congress at the instigation of the NRA. A good recent summary of the problem is provided in an open letter to Vice President Biden (as chair of the Commission on Gun Violence) signed by a senior group of 108 professors and analysts from prominent universities and institutions. Despite the importance of gun violence to our health, the US Centers for Disease Control and Prevention (CDC) has been effectively blocked from sponsoring research on understanding the issue, and the CDC and the US Bureau of Alcohol, Tobacco, Firearms, and Explosives (ATF) have not been allowed even to assemble and disseminate relevant data. As a consequence, high level review commissions have been forced to say, honestly, that we simply do not know what the impact of various possible gun measures might be. Comprehensive reviews in 2003 by the CDC and in 2004 by the National Research Council of the National Academies of Sciences had to conclude that the research has not been done, nor even the data assembled to permit such research to be done, to determine what might be effective in curbing gun violence. And as the CDC report notes in its up front summary: “insufficient evidence to determine effectiveness should not be interpreted as evidence of ineffectiveness.” They both called for further work, but I am not aware of a similar commission and review since 2003/2004, which itself is indicative. It is extremely important to keep in mind that while we do not have adequate analysis which can allow us to say with any certainty what measures might be taken to reduce gun violence, that does not mean that measures to control the availability of firearms will not be effective. We do, after all, see the lower homicide rates, and especially the far lower homicide rates by firearms, in countries that have controlled access to firearms, such as most of Europe and Japan. Figures are cited above. And it is not true that the overall level of crime is especially high in the US. According to statistics issued by the OECD, the overall crime rate in the US, as well as the rate of criminal assaults and threats, are in the middle of the ranges for the 26 OECD members reviewed. Where the US stands out is not in criminality, but in homicides resulting from criminality. The easy availability of guns certainly has something to do with this. Update: An observant reader noted that in my original post I had mistakenly referred to Sandy Hook Elementary as Sandy Hill Elementary. I have corrected that in the above. My thanks to that reader. This entry was posted in More Political than Economic and tagged gun control, policy, US politics by aneconomicsense. Bookmark the permalink.